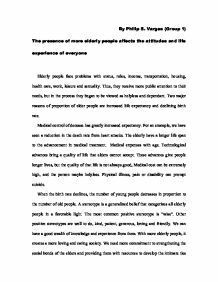 The presence of more elderly people affects the attitudes and life experience of everyone. 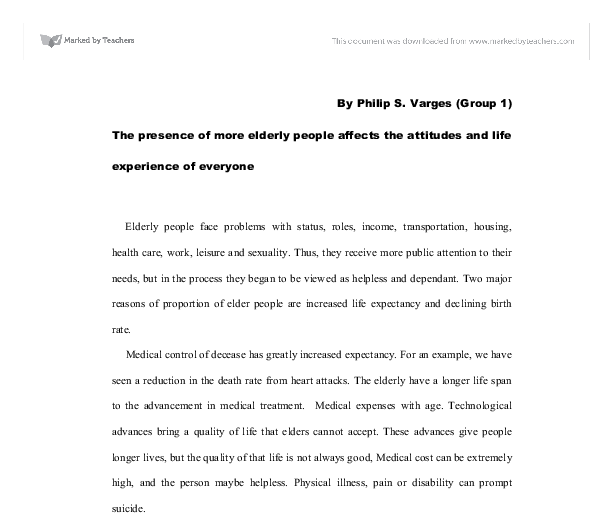 By Philip S. Varges (Group 1) The presence of more elderly people affects the attitudes and life experience of everyone Elderly people face problems with status, roles, income, transportation, housing, health care, work, leisure and sexuality. Thus, they receive more public attention to their needs, but in the process they began to be viewed as helpless and dependant. Two major reasons of proportion of elder people are increased life expectancy and declining birth rate. Medical control of decease has greatly increased expectancy. For an example, we have seen a reduction in the death rate from heart attacks. The elderly have a longer life span to the advancement in medical treatment. Medical expenses with age. Technological advances bring a quality of life that elders cannot accept. These advances give people longer lives, but the quality of that life is not always good, Medical cost can be extremely high, and the person maybe helpless. ...read more. The aged are happier if they form intimate friendships with others, Neighbors and social organizations such as the Rotary Club, church and senior centers are important sources of social interaction to the elderly. More attention should be directed to the social bond of elders. It creates a circle of companion for them. Millions of American children receive childcare form their grandparents each day (U.S Bureau of the Census 1990). Parents don't have to spend money sending their kids to the baby sitters. The grandparents indulge grandchildren, try to be a role model and instill good values to the grandchildren. The grandparents could be a repository of family wisdom. Retirees may feel both elated and free or devalued and depressed because of changes in routine, personal habits, and opportunities for social interaction, retirement can bring stress even when it is voluntary. ...read more. Adult children most commonly offer help: shopping for food, traveling, doing laundry, preparing meals, doing housework, taking medicine, getting around the house and providing personal, supportive communication. The number of older persons is large and growing larger, and ageism directly affects the older population. Ageism limits the potential development of individuals on the basis of age. Ageism can oppress any age group, young or old. If you're young, you may have been told that you're too inexperienced, too immature, to untested. If you're elderly, you may have been told that you're out of date, old-fashioned, behind the times, of no value or importance. When younger, stronger, faster workers with newly acquired knowledge are available, employers tend to replace, rather than retain, the elderly. In reflecting what old people deserve in later life, we must conclude that they deserve a later life, we must conclude that they deserve a fair share of the "good life" - respect, dignity, comfort and resources for experiencing new or continuing pleasures. ...read more. This student written piece of work is one of many that can be found in our GCSE Child Development section. Why family structures are changing. growing up in an unsuitable environment with only one parent looking after them, from the PSNI website they stated "families who have experienced abuse with children involved usually mean that the children involved will be disadvantaged as they grow older. * If you desire you can be accompanied by a friend or relative during consultation or examination. * You have the right to refuse treatment - the consequences of refusing treatment will be made clear to you. * To be informed of hospital regulations. children continuously watch and observe what is happening around them with a little bit of understanding and analysis. As they reach the age of eleven they start to imitate what they have been seeing even thought they might not even know the purpose of what they are doing!". Review of Other-Esteem by Philip O. Hwang, Ph.D. I do not think that these tombstones are any symbol of the owners religiousness, more a case of their inflated egos, the fact that they wanted to be remembered even in death, and also conspicuous consumption- they wanted to show they were rich even though they were dead! Looking for expert help with your Health and Social Care work?